Bin accessories to help keep parts organized and maximize the bins capacity. 2-7/8 x 7/8" label holder. 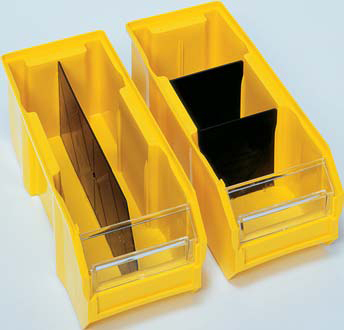 ZZ-LTR-0813 clear label holder is designed for use with Economy 4"H and Store-More 6"H bins. Inserts are laser and inkjet compatible. Fits all shelf bins except ZZ_QSB100. Each case includes 25 label holders. ID 3-1/4 x 1-3/4 x 3" Bin Cups are available in Blue and Yellow. Cups fit neatly into the bin. Their unique design allows for easy labelling. Entire bin cup can be removed for and easy refill of contents. Bins can accommodate a maximum of seven bin cups. Must order in full case quantities. We can't break cases. Quantity per case is 48. 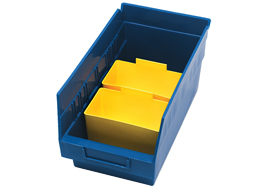 ID 5-1/8 x 2-3/4 x 3" Bin Cups are available in Blue and Yellow. 5-1/8 x 2-3/4 x 3"
4-1/2 x 3-3/4 x 5-3/4" Divider. This divider is used to create partitions on 6"H Store-More shelf bins. Dividers fit securely into bins when installed. Creates partitions that can be used to separate stored items. Dividers fits horizontally across bins. Uniquely designed to allow for easy part labelling via individual label slots. Slot at the front of the bin closes off hopper to create more storage. Each bin can accommodate up to eight dividers at at time. 4-1/2 x 3-3/4 x 5-3/4"
6-1/4 x 4-3/4 x 5-3/4" Divider. 6-1/4 x 4-3/4 x 5-3/4"
8 x 4-3/4 x 5-3/4" Divider. 8 x 4-3/4 x 5-3/4"
11 x 4-1/2 x 5-1/4" Divider. 11 x 4-1/2 x 5-1/4"